Only one week on from China and yet more parts have found their way to the cars for Bahrain. Although all teams will have brought a set cooling package to cope with the much higher temperatures (air was roughly 30-35 degrees, track was 40+ degrees), many teams found a way to install some more aerodynamic modifications to cope with the unique demands of the Sakhir circuit. Caterham are on course to bring a large update package for both cars to Barcelona. However, Charles Pic got to run half of the overall package that will be brought to Spain in three weeks as Caterham felt the need to gather data and attempt to see exactly where they are at relative to Marussia. The upgrades worked as expected, which often cannot be said for this small team as previous modifications have often been less fruitful. On this occasion their efforts appear to have paid off, finding at least half a second with the second half of the parts yet to be brought to the car. Pic was the highest finisher of the new teams and was only a handful of seconds behind Daniel Ricciardo’s Toro Rosso. Things are looking promising for the Oxfordshire based outfit as we head into Europe. Coupled with Heikki Kovalainen being back in the car on Friday’s, we should finally see some proper progression over the next coming races. Above shows the main comparison between the new (top) and old (below). Up front, the car now features a “pregnant” nosecone, designed to encourage flow to reach further down and beneath the flow of the car without a high drag penalty. The wing pylons and the wing itself are unchanged but expect those changes to come in Barcelona. The other main feature is the rear wing. Previously, the conditioners that hang beneath the rear wing were longer and were attached at the base. These twisted fins expand air coming off of the diffuser by straightening the turbulent flow coming off of the tyres (formally known as “tyre squirt”). This expansion effectively makes the diffuser ever-so-slightly larger, improving downforce. The other alteration to the rear wing is the endplates. Five horizontal slats have replaced the previous four curved gills to reduce wingtip vortices, reducing drag and enhancing the overall performance of the wing. The horizontal slats should even out the pressure difference more evenly across the wing before the flow hits the wingtips. The curved gills will have only evened out pressure at a certain points on the wing. Also visible from this front facing shot are the two sidepod conditioner modifications (unfortunately I have not been able to edit images yet for your benefit but I will do my best to describe where these modifications are!). On the outboard side of the sidepod (next to the two vertical vortex generator fences), the conditioners top edge has been curved downwards and attached to the sidepod itself, much like what Sauber and Red Bull have been doing. However, only half of the device as been formed onto the sidepod, the other half remains exposed, as there is a slot between the two sections of it. This allows flow to be controlled over the sidepod, inducing a better downwash effect, helping the exhaust plume to point downwards towards the floor. It also allows flow from the front tyres to be managed around the side of the car more efficiently at the same time. Ferrari introduced these interesting cooling louvres to put up with the high desert temperatures. Since 2009, the rules really restrict teams opening up the bodywork but there is a small space available above the floor that Ferrari have utilised. These louvres release hot air from the radiators but will not aid any other flow as this air is often dense has a slow velocity. Ferrari tried using hot air extraction as a way to boost downforce at the rear of the car last year but this turned out to be a failed exercise. The Prancing Horse also featured another iteration of their front wing concept. The top flap that was split just in the inboard section has now been cut all the way across the plane and joins onto one of the existing slots at the endplate. This aids flow management over the suspension arms rather than producing more downforce. The position of the camera pods were also changed. All cars must have a specific number of camera pods that they can place in a variety of spaces on the car (except the mandatory T-cam – the one you see on the onboard footage on TV). These pods can be used in an aerodynamic advantage as most of them do not contain cameras anyway. Previously they have both been behind the front wing main plane between the two wing pylons. However, in a bid to further manage flow between the suspension wishbones, they were placed further up for this weekend in line with the lower wishbone. Following up from the Williams concept introduced right at the start of the year, Red Bull have come up with their own version of the blown axle system. Flow that is otherwise used to cool the brakes is instead passed through the hollow axle, exiting flush to the wheelnut surface. The half-moon shape tunnel can be changed in shape or rotated inside the axle to exit the air in a desired way. This relatively fast flow can then be projected into the wake caused by the front tyre, reducing drag and increasing efficiency. The lap time benefit is less than a tenth of a second, but that all adds up over a race distance. A new front wing was also introduced, following a similar path that Ferrari have taken with their latest edition. The top flap is also split across its entirety, with the inboard part of the flap altered slightly to be at a decreased angle of attack than the remaining section. The position of the front flap adjuster (the small housing with a yellow ring around the centre) has been changed, leaving it away from its previous placement near the outboard section of the wing. Similarly to what a lot of teams have been doing lately (Ferrari, Lotus and McLaren in particular), Red Bull have moved to horizontal slot gaps in the rear wing endplate. As mentioned above in the Caterham section, these five slots (that are bent down at their trailing edge) should spread more constant pressure across the extremities of the wing, reducing the size of the vortices produced at the rear wing tips. Mark Webber chose to run with a low downforce beam wing for qualifying and the race. It features a stepped profile, with the outer edges being much shallower than the slotted central section. Surprisingly, Williams reverted back to a 2011-spec rear wing that was used at the low drag circuits, such as Canada, for Bahrain. The wing features a boomerang or bow-shaped profile, the centre of the wing having a much shallower cord than the outboard sections. Perhaps their downforce issues could be compounded by high drag, a problem similar to what Ferrari experienced last year for most of the season. Although Bahrain does have a fairly long pitstraight and back straight, I would still class it as a circuit that needs more downforce demands than low drag, but Williams have the numbers and I do not! This entry was posted in 2013 Highlights, Technical Highlights on April 22, 2013 by thewptformula. Interesting as always. I was pretty staggered to read Williams had gone back to a 2011 wing. Not only is that a couple of years ago, their car was a dog in 2011. On the other hand, it’s a dog now, so maybe it makes sense. I thought they’d have a much more competitive car this year. Reckon that Caterham/Marussia have any chance of points scoring? They still seem too far back. 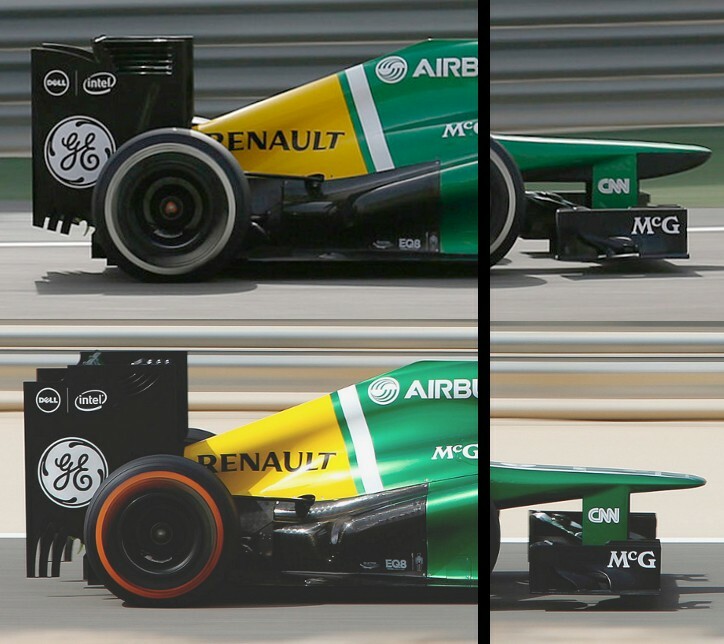 It also looks like Caterham’s paying the price for having two new(ish) pay drivers. Plus, Bianchi seems to be the fastest of the back four right now. I found it surprising because no one else brought anything similar. It could just be a balance issue, perhaps they had a lot of understeer. This will cost them total downforce but should help driver confidence. If Caterham’s complete upgrade works in Spain then they might have a shot at points in a race the produces unique circumstances, such as a lot of rain, exploiting safety car timing etc. Other than that I do not think they will score. It is very disappointing that they have not been able to advance forward as much as we would have hoped for but they are slowly (very slowly) getting there.